A waterless engine coolant recommended by Rotax Aircraft Engines. 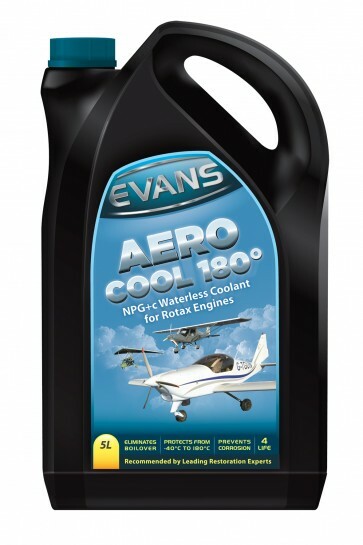 Aero Cool 180º NPG+c protects engine cooling systems from -40ºC to 180ºC. The unique properties prevent many of the problems associated with waterbased coolants such as Overheating and Corrosion. Aero Cool 180° has a boiling point of 180°C and will not boilover. Water contains oxygen, oxygen allows corrosion. Aero Cool 180° eliminates corrosion. Aero Cool 180° allows your cooling system to run at a lower pressure, reducing the strain on engine components. Aero Cool 180° generates significantly less pitting when compared with all water based coolants. Aero Cool 180° eliminates premature detonation associated with overheating. Traditional water based coolants regularly cross the thermal boundary that separates efficient Nucleate Boiling (A) from inefficient Critical Heat Flux. CHF is synonymous with the condition ‘Departure from Nucleate Boiling’. When DNB occurs a layer of steam bubbles form adjacent to the engine hot-spots (B). Steam dissipates less than 1/30th of the heat that water does, rapidly over-heating local metal, causing premature detonation.